The comment from Rob at CrabAppleLaneBlog on my post about trains got me to thinking about the sounds I used to fall asleep to growing up. Given that our house was situated on the main business road that ran through Tewksbury, Massachusetts, I got used to falling asleep to the hissing sound of cars passing by our house. To this day, I love the sound of traffic at night, even if it’s a good distance away. Some people need absolute silence to fall asleep to – me, I don’t mind the sounds of life outside when I’m falling asleep. Reminds me of this classic Doors tune from 1971. They just don’t make ’em like that anymore. Back in the sun and heat. But I sure loved seeing the lilacs out back in Massachusetts. Whenever I see the lovely fragrant purple flower against green grass and gray skies it’s like someone turned a key and unlocked a door back to my youth when we had two large lilac bushes astride the walkway leading up to our front porch. We also had a white lilac tree near the woods in our backyard. The white lilacs aren’t quite as fragrant, but they’re pretty nonetheless. Come to think of it, my grandparents had a huge lilac bush by their bedroom window at their house in Woburn. I think that’s how a lot of folks planted them back then – so they could get the fragrance outside their open window. The weather here in New Engand continues its slow gloomy march, but that didn’t stop me from taking the Lowell line commuter rail into Boston for dinner in the North End at Pagliuca’s, one of my favorite Italian spots. The bread was a standout (you simply can’t find good Italian bread in Phoenix), the sausage with marinara appetizer wonderful, and the veal was its usual fantastic. The best part of the day, however, the train ride into Boston. I’ve always enjoyed taking the train as it makes its 40-minute leisurely run from Lowell into the city. As we passed swampland, the backyards of homes, and the backs of industrial buildings of various types, I couldn’t help but think how the rail lines traces my own life history to a certain extent. In Somervile, the train passes a house my mom used to live in. In Woburn, I pass through the city where I was born and had my very first apartment, and at the train station I can see the Logan Airport express bus I’ve taken many times when visiting here in the past. In Wilmington, I remember all those nights when my mom would pack us in the car to pick up my dad, who used to take this very same line into Boston for work when I was growing up. In North Billerica is where I went to church most of my years as an Episcopalian, where I had an apartment for a number of years, and where my wife Tracey lived when I first met her. The surroundings themselves haven’t changed that much over the years, I don’t think. The cranberry bogs in Wlmington are now just wetlands and lots of the houses have additions and decks to mark the passage of time and the departures and arrivals of the families who have lived in them, but the Winchester downtown hasn’t changed all that much, I still don’t know what town or city the Wedgemere stop is in, and the industrial buildings and trainyards all look like they’ve been there for years. I can’t help but wonder how much I’ve changed as a person since I first rode these rails as a teenager. In some ways, a lot – definitely when it comes to age and appearance. But inside? Maybe not as much as one might think. But I love the way the train moves and the muted sound of its whistle as we pass through grade crossings. Back in Arizona, we have a freight train that comes through up the street every morning around 2 AM. And even if I can’t sleep, the sound of the whistle soothes and relaxes my mind and speaks to the restless bones I’ve always had. With my eyes closed and snuggled in under the covers I can imagine the train working its way southeast towards New Mexico or northwest towards California, and from there who knows? It’s all left to the imagination. And that’s what, in the end, is what I think makes trains the magical form of transportation they are. There’s something about trains that fire the imagination and instills in one the thoughts of faraway places that planes and cars can’t match. Maybe cruise ships have the same quality, but they’re not as accessible. Train travel is also more leisurely and deliberate than air travel, and train tracks wind through places you normally would never go and/or see. Anyways, it was a nice day. You Wanted A Break From The Sun And Heat? You Got It! Friday: Arrived in the early evening to cool cloudy conditions. Saturday: Gray and cool for golf at The Oaks in Somersworth, New Hampshire. Very pleased with the changes I made with my golf set-up and swing, although short game needs a lot of work. By mid-afternoon it started drizzling – just enough for everything to start getting a little damp. Sunday: Gray and cool for post-Easter dinner with the family, rain arrives late in the afternoon. Monday: Gray and cool with drizzle in the area. Great weather if you’re playing golf in Scotland, and not too wet to prevent me from some quality time chipping and putting. The drizzle that started back up just as I was completing my practice turned into a steady rain for a short time, then back to drizzle again. Tuesday: Gray and cool with a steady drizzle interspersed with occasional light showers. A perfect day to stay in to do some maintenance and software upgrades on my folks’ computer. Took a drive up to the ocean which looked wonderfully gray through a steady rain and wind. Made a tee-time for golf on Thursday that looks quite doubtful at this time. Wednesday: The forecast is for steady drizzle with occasional showers. Thursday: The forecast is for occasionally heavy rain with occasional drizzle. Friday: Just in time for a few possible peeks of sun, I’ll be heading back to Phoenix. But that’s New England weather for you. Today we said a sad goodbye to our rabbit She’s-Just-A-Little-Half-Pint (a.k.a. “Half Pint”). 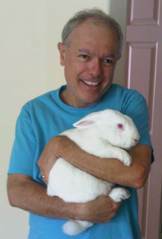 Half Pint was our oldest rabbit (although, at five years, not that old for a bunny). She’d been on antibiotics for an infection she had gotten a few weeks ago, and we thought it had been taken care of, but evidently not. Tracey found her ill on Sunday morning, and after consulting with our vet today, made the hard decision to have her put down. Half-Pint was a mini-lop who we took in from another family who didn’t want her and who had been keeping her all alone in their laundry room – sad surroundings for bunny who loved people and craved attention. From the very start she loved being with us, and the feeling was mutual. Half Pint loved to be loved, and was always ready for your complete and undivided attention at a moment’s notice. Half Pint loved to be cuddled, kissed and hugged, and she loved to give bunny kisses back in return. She loved being let out of her cage area and would tear around the house, sliding around the tile and wood floors. She was fearless, and wasn’t afraid to show the other rabbits in our house who was boss. More than anything, she loved darting under our Christmas tree to tinkle the glass bell ornaments we’d be sure to hang on the lowest branches just for her. She snored whenever she would nap, and I’ll miss the sound of her squeaks during the day while I’m at the home PC. Rest in peace, Little Half Pint – you loved to be loved, and you sure experienced a lot of it in your life. Most animals should be so lucky. You were loved, and you will be missed. 2. That being said, it sure didn’t stop both of my flights from being jam-packed. Both flights had lengthy standby lists and numerous pre-flight announcements begging people to defer their travel in return for the offer of travel vouchers. 3. Maybe it’s just me, but I’m not much of a travel voucher guy. First of all, when I’m traveling either to or from for leisure, I just want to get there. The idea of hanging around an airport any longer than I have to is just not my idea of time well spent. All you end up doing is overpaying for average food and drink, and I’ve heard horror stories of people with vouchers getting bumped off of the later flight they supposedly were promised a seat on. 4. The most important number when you fly is the zone number indicated on your boarding pass. Today I was lucky enough to have “Zone 2” marked on both my flight passes, which meant there was still plenty of room in the overheads for my carry-on. If you’re unlucky enough to get Zone 4 or above (and I’ve had it happen to me even with a Zone 3), you’re screwed. Prepare to know that feeling of helplessness walking up the aisle to see most, if not all, the overhead doors closed or showing zero space for your bag, then having to fight your way forward like some pathetic salmon trying to swim upstream to have the flight attendent check your bag as a tide of people are going through the same thing. “Rich Lerner here from Golf Channel with this week’s “Spotlight On Golf”. You may not know who Doug Richard is from hanging around your club and quaffing a cold brewskie at the 19th hole after a feisty round of skins or bingo bango bongo, but you no doubt have heard of The Great White Shank from Goodboys Invitational and Goodboys Nation weblog fame. Rich, it’s great to talk with you. Sit down, have a lemonade and a sandwich. RL: You’re heading back to Massachusetts this weekend, and you’ve been working hard on your game. How do you see the state of your game at this time, Great White Shank? TGWS: Well Rich, I feel good. I started out this year with the sole intent of working on my set-up – squaring up, getting my hands and body lower, and making my backswing a little less flat, and I think I’ve succeeded in that. We’ll see what happens when I tee it up this coming weekend. RL: You’ve recently taken to chipping balls in your front yard. Where did that idea come from? TGWS: It goes back to the driving range being what it is vs. what I felt I needed to work on. Out here I can just focus on my set up and timing, and it’s paid off big time. I’ll hit a 8-iron or 6-iron and just try to hit that light post behind that tree in the center behind – don’t swing too hard, let the club do all the work. That light post is 108 yards away, but with the concrete it really only plays to about 80 yards. One bounce and try and hit the light post, that’s what I try and do. I’ve actually hit it several times. It’s a great way to work on your set-up and your timing, and making good solid contact with the ball. RL: You recently purchased new Cobra S2 woods. How are you hitting them, and are they going back to Massachusetts with you? RL: Who would have thought that after all these years The Great White Shank would be re-focusing himself on such basic fundamentals as his set-up, mental game, and course management. It’s something, I think, the high handicappers out there can take a lesson from. TGWS: Rich, this game is about… tradition and integrity and honor. Me? I’m just glad to be out here, to be honest with you. And if there is any way I can help someone realize their own dreams when it comes to this wonderful sport, well I’m just glad to be that role model. RL: A lot has been written about Tiger Woods this week. Bubba Watson says he needs to toss all the Sean Foley technical stuff out the window and just get back to swinging the club naturally. Your thoughts? TGWS: I haven’t talked to Tiger recently, but I think Bubba’s got a point there – I mean, after a certain period of time, you are what you are, and your swing is what your swing is. So why fight it? If I had Tiger’s ear I’d tell him to forget about Sean Foley and listen to my own swing coach, Ben “The Funny Guy” Andrusaitis. If Tiger’s got a “death move”, TFG’s the guy to find it for him, then he’d just turn him loose to do what he does best. Another thing I’d tell Tiger is, rather than spend an hour or two on the range before you tee off, take 5-10 swings and then have a beer with the boys at the bar instead. He’d enjoy his round a whole lot more. I know I do. RL: Your toughts about Tiger withdrawing from THE PLAYERS today? TGWS: Hope you remember to put THE PLAYERS in caps when you write this, Rich, or Tim Finchem will be all over your a** like a lawnmower. Look, I don’t want to cast aspersions on Tiger in any way, but I’ll say this: you guys in the media went all gaga over the toughness of Tiger Woods when he won that U.S. Open at Torrey Pines. He could play and win hurt, you guys said. He could beat anyone on one leg, you guys said. Well, we’re apparently seeing a different Tiger Woods out there now – a player who seems to lack the mental toughness to compete through pain like he used to. Perhaps he’s hurt more seriously than he’s letting on. Or perhaps his knees and legs are just wearing down after decades of playing golf. Perhaps he’s just burned out and loses interest more easily if he’s down early. Who knows? But regardless, quitting after you get off to a bad start and then blaming it on an injury that’s nothing compared to what you played through at Torrey Pines doesn’t look very good. RL: Great White Shank, always a pleasure and interesting conversation. TGWS: Thanks, Rich, for having me on. Tell Kelly I said hello. I wonder how much taxpayer funding is involved here. Headline: Scientists report changes in vegetation determine how animals migrate. Well no sh*t, Sherlock. I wonder how much taxpayer money went into the funding of that study. Headline: Widespread Flaws in Weather Stations Networks Used to Track National Temperature Trends, Says New Study. Like the old saying goes when it comes to computing, “garbage in, garbage out”. Headline: White House calls rapper Common ’socially conscious,’ opposes cop killing lyrics. OK, White House, so which is it? Headline: Michigan Cops Cage Caped Crusader In Bizarre Rooftop Incident. No word on whether Robin was anywhere to be found. Headline: AP-GfK poll: Obama approval hits 60 percent. Amazing what your poll numbers will show when your Dem/Rep/Ind split oversamples Democrats by a whopping 17%, when in the recent mid-terms the split was 31/28/26. Not that I expect any kind of journalistic integrity from the AP, but don’t they realize anyone with five minutes of time could analyze their sample and see how nutty it was? Headline: Postal Service reports billions in losses. You call that news? I’ll tell you what would be news, if the USPS posted a profit. Last week I mailed my Mother’s Day card on a Monday from Arizona, and it took a week – a week! – for my mom to get it in Massachusetts. If there was ever a government agency that could be replaced by the private sector it would be the USPS. Headline: Philip Morris Int. CEO: Cigs not that hard to quit. I mean, that’s just absurd. Headline: Scientists stung by theft of research bees. Heh. Now there’s someone who knows how to write a catchy headline. A naked man terrorizing passengers on a NYC subway train. Well Mr. President, we already have a moat – at least in Texas – it’s called the Rio Grande. And we don’t need alligators down here, just plenty of National Guard folks allowed to patrol with guns containing, oh I don’t know, real ammunition. Like the kind used to kill Osama bin Laden. Y’know that trophy you can’t seem to let go of? And how about a fence? Oh never mind, we here in Arizona are going to build our own. No point in waiting for you or your administration to show leadership on this (or anything, for that matter). But if we need a Campaigner-in-Chief we’ll let you know, that’s obviously where your interests lie. Herman Cain wins another GOP straw poll, this time in Washington state. Don’t expect so-called “mainstream conservatives” or the usual Beltway prognosticators with their so-called “conventional wisdom” to notice, however. They’re too busy yakking about Donald Trump, Mitt Romney, Newt Gingrich, or Mike Huckabee – none of whom, BTW, stand a ghost of a chance of winning the GOP nomination, let alone beating Barack Obama in a presidential contest. You know how you’ll be able to tell when Herman Cain is starting to make serious inroads? When you hear from “unnamed Republican” or Party insiders whispering about his prior health issues, or Democrats starting to calling him a “Uncle Tom” or ridiculing his past business experience. Hmmm…. I bet if a bunch of Christians attacked a mosque anywhere in the world it would front-page news everywhere. But the violence against the Coptic Christians in Egypt is both disheartening and heart-breaking. That the Obama administration doesn’t condemn this is truly despicable, although not surpring. I don’t care what anyone says, if Barack Obama is a Christian, then I’m Kenyan. And all the while, the Mississippi River keeps rising and moving southward. I’d be concerned if I lived anywhere near New Orleans. I’ll bet a lot of business there are already over-extended after the Katrina disaster, if there were serious flooding there it might be the last straw for a lot of people and businesses. Not only do I have my official golf ball for this year’s Goodboys Invitational, but I have my official song as well. I only wish I could golf as well as McCartney plays that ukelele…. Get greater distance and accuracy with the Ram® Laser distance golf balls. But that’s OK, they’re cheap and they don’t feel like rocks when you hit them. And the orange color is a reminder to me that I’m not a pro or even a good golfer, and never will be. So stay humble, keep it in the fairways and out of the woods and the water, and advance the ball at every possible opportunity. My month of preparation is thus over. There have been significant (at least for me) changes in my set-up and address, my backswing is still a work in progress, and my finish is getting better. Now it’s time to start thinking about playing some competitive golf on New England golf courses. The one thing I’ve learned over the years is that you can’t prepare for playing New England golf by playing on Arizona courses: the grasses are all different and the super fast greens play head games with your putting stroke. This coming weekend I’ll be back in The Land Of The Veal Cutlet Sub and The Fried Clam to play some golf with the Goodboys and hang out with my peeps for a few days. 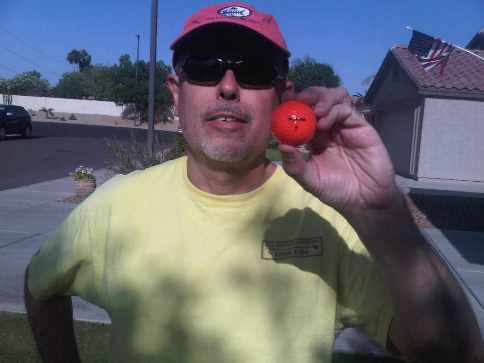 With my new orange golf balls.